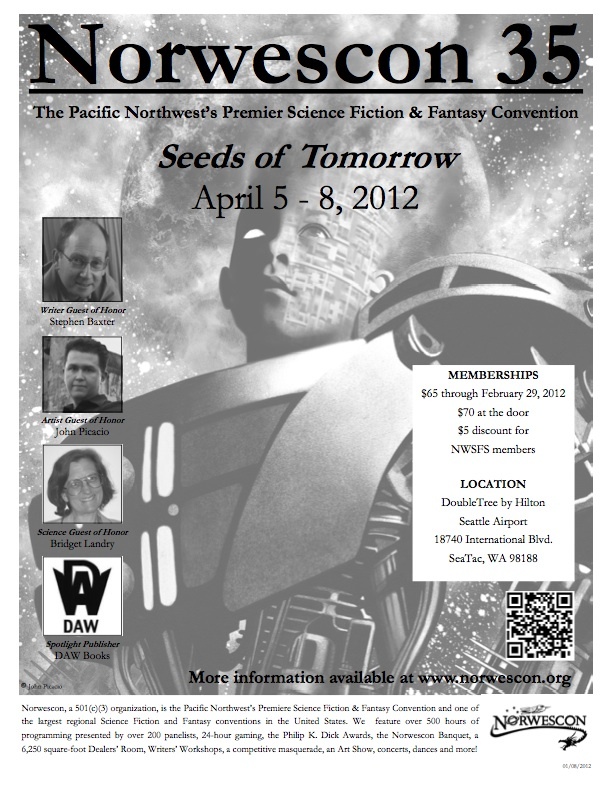 Norwescon wouldn’t be what it is today without all of you wonderful fans helping to spread the word — and trust us, that’s very appreciated! To that end, then…here’s this year’s flyer! Produced in two glorious colors — black and white — to ensure easy and inexpensive duplication, this stylish 8.5″x11″ flier features headshots of our Guests of Honor (Stephen Baxter, John Picacio, Bridget Landry, and DAW Books) against a backdrop of artwork by our Artist Guest of Honor, John Picacio. Download the high-resolution flyer (1.5MB .pdf), print it out, hand it to your friends, post it to your cubicle wall, mail it to random strangers, fold it into a paper airplane and send it flying…you’re creative types, figure it out! Or, download the medium-resolution JPEG file (192KB .jpg) to post to your blogs, Twitter accounts, Facebook profiles, or anywhere else it might go in this electronic world we live in.